Fatah rebroadcasts video in which Abbas calls for violence to prevent Jews from ascending Temple Mount following deadly terror attack. The ruling Fatah party of Palestinian Authority chairman Mahmoud Abbas rebroadcast Abbas' call for violence at the Al-Aqsa Mosue in 2014. The broadcast was in response to the closure of the Temple Mount following the terrorist attack in which two police officers were murdered Friday morning. Palestinian Media Watch reported that Fatah posted the video on its official Facebook page. In it, Abbas calls on Arabs to use violence to prevent Jews from ascending the Temple Mount. "We must all carry out Ribat [religious conflict] in the Al-Aqsa Mosque... We have to prevent them, in any way whatsoever, from entering the Sanctuary... They have no right to enter it. They have no right to defile it. We must prevent them. Let us stand before them with chests bared to protect our holy places," Abbas says in the video. 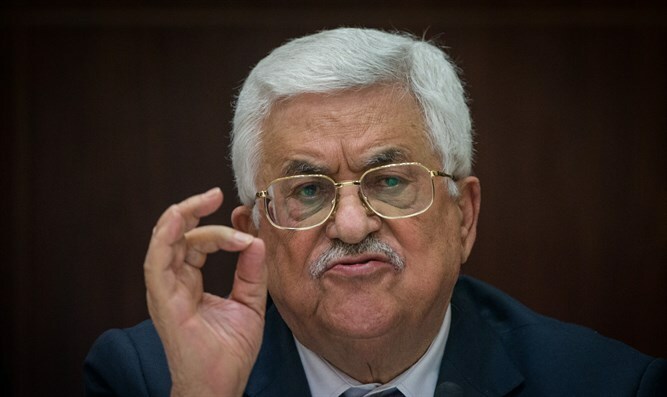 The rebroadcast of the call to violence contradicted Abbas' condemnation of the deadly terrorist attack in a telephone conversation with Prime Minister Binyamin Netanyahu, as well as his statement that he "opposes any act of violence from any side, particularly at places of worship," which was reported by the Official PA daily Al-Hayat Al-Jadida. Israel closed the Temple Mount to Muslims for two days following the attack in order to carry out an investigation and to adopt new security measures. The Temple Mount was reopened to Muslim worshipers earlier Sunday.